The latest from Harmonia Mundi’s Debussy Centenary celebration sees two duos – Belgian soprano Sophie Karthäuser and French baritone Stéphane Degout with pianists Eugene Asti and Alain Planès respectively – deliver a two-disc recital of Mélodies. 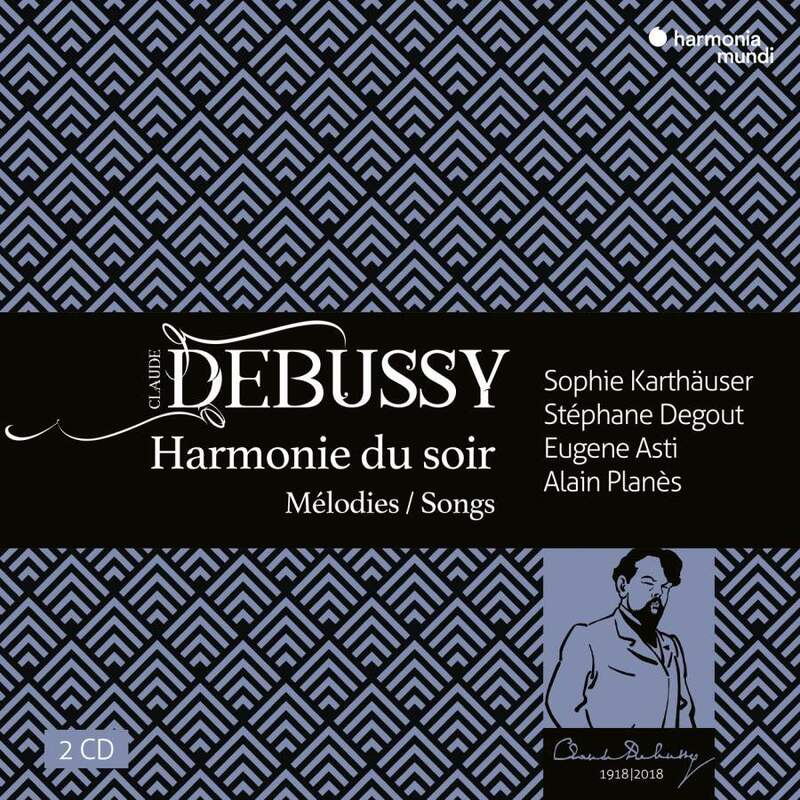 Debussy wrote almost 100 songs, which form a rich vein of his output reaching a pinnacle in Pelléas et Mélisande (in which Degout and Karthäuser have both sung the leads). Karthäuser cut her teeth on Mozart but has since embraced lieder, releasing discs of Wolf and Poulenc in recent years. Hers is a lighter, more fleet-footed soprano than the British Lucy Crowe, who capped off Hyperion’s survey of Debussy songs in 2017. Karthäuser’s Fantoches, for example (heard here in the later iteration as part of Fêtes galantes) is playful and articulate, capturing the whimsical energy of Verlaine’s poetry. Her twilit transparency in Beau Soir is magical, swelling to a shimmering climax, while her high register chimes beguilingly in Les Cloches and Les Angélus, Asti peeling below. Degout also acquits himself admirably, his baritone gliding masterfully over Planès’ roiling piano in La mer est plus belle que les cathédrales, while his crescendo out of the desolation of Colloque sentimental on the words “bonheur indicible” (unspeakable happiness), is heart-wrenching – the lover’s distant reply could almost be a different singer.